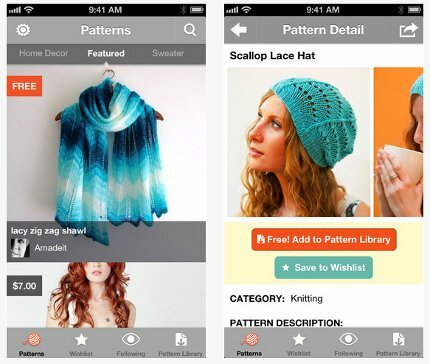 As its first foray into mobile browsing, Craftsy announced today that it has launched a free app for the iPhone that will allow users to browse — but not buy — knit and crochet patterns. So far the app is only for knitting and crochet, and users cannot buy patterns directly in the app because Craftsy would have to pay a percentage of sales to Apple. Craftsy does not make any money from pattern sales from its site. With the app you can search for patterns, add free patterns to your library and mark patterns you’d like to purchase later by adding them to your wish list. In addition to the app, Craftsy recently went through a redesign that makes it easier to find patterns you want, including a category menu that makes it a lot easier to find patterns of interest to you. Do you ever shop Craftsy for patterns? I haven’t looked at much there and would love to hear your thoughts if you do. I have taken a few of their classes and they are great. Well described,good pictures, the teachers take it slow and easy so you have enough time to understand. I recommend them highly. I have bought several patterns from Craftsy and also downloaded several free patterns – all great. Please make this available for android devices, too. Thanks! Well done…again. You efforts putting this blog together was worth the while. Well put Sarah.